Can we produce fruits and vegetables in the desert? : Introducing Luther Burbank. Home #4 Biology Can we produce fruits and vegetables in the desert? : Introducing Luther Burbank. 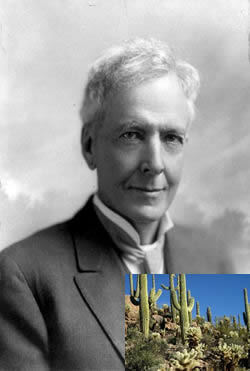 American botanist, horticulturist and a pioneer in agricultural science, Luther A. Burbank. And Green is also the color of Abundance ... Abundance of Food and Fruits in Nature, Abundance of Dollars or Euro or Pounds ... Abundance ... is Green. May be I listen the Ascended Masters ... and you have no idea who they are ... or where they are ... but ... remember ... 'Likes attracts Like ...'. Now, I need to confess that I begin to read the book, 'Saint Germain on Alchemy' in 2007 ... and only some days ago ... after five years ... I purchase a cactus. 152 The work begun many years ago by Luther Burbank, who acted under the direction of the hierarchy in his experiments with nature and the grafting of plants, will be brought to a new degree of perfection as certain influences within the hearts of the seeds themselves are revealed through advanced studies in cytology. 153 Within the heart of the desert cactus is locked a secret whereby the arid areas of the world can indeed be made to blossom as the rose (Isa 35:1) and produce all manner of fruits and vegetables with far less moisture than is presently required. Water shortages may thus be alleviated. 154 The present surge in world population, which seems to have caused many demographers to review and revise the doctrines of Malthus with the aim of extinguishing or limiting human life in complete contradiction to God’s laws, 155 will prove of less concern to future societies as they become aware of marvelous methods of increasing agricultural production, of harvesting the wealth of the sea, and of the unlimited use of atomic energy in advanced city planning as well as in interplanetary colonization. 156 There is a purpose in the plans of God which far transcends the understanding of the human intellect and the memory of history upon earth. 157 The wonders that are to come will soon be dwarfed by still greater wonders, and therefore all life should live in a state of constant expectancy. 158 It is the joy of the mind of God to give richly of his blessing. 159 But above all, may I counsel you now, students of the Light and all mankind: 160 Obtain first from God the Father the wisdom to live peaceably, 161 to deal gently and courteously with one another, 162 to promote the education of mankind the world around, 163 and especially by honest efforts to prevent the increase in number of those indigent individuals who are prone to commit crimes against society. 164 The value of training the young in a proper manner and encouraging them to live lives of useful service and good character cannot be overestimated. 165 Political scandals within the nations of the world and the harshness of police-state methods (as enforced in Communist-dominated countries) must be overridden by the sword of the Prince of Peace. 166 The Prince of Peace is imaged in the compassionate Christ going forth to teach all nations that the way of God is good, that his wonders are intended to be used and possessed by all and exclusively by none. 167 A higher way of life than vain competition must be pursued. Men must become God-spurred and less motivated by status seeking. I expect that ... if you read these words ... do you believe in God. Otherwise are senseless. I hope you want to help the World ... offering a system to produce and triplicate and multiply fruits and vegetables ... Like Prof. Burbank did. In fact, Scientist Luther Burbank were able to developed more than 800 strains and varieties of plants over his 55-year career. Burbank's varied creations included fruits, flowers, grains, grasses, and vegetables. He developed a spineless cactus (useful for cattle-feed) and the plumcot. What about to produce and fix streets in Israel? ... in Jerusalem? ... in Libya, in Egypt ... giving fruits to everyone ... exalting the Love of God ... instead to disturb phantom? There are NO ONE ... and is to take care of your Brother ... to be the Brother's keeper. Not disturbing ... with your ridiculous ego ... and nurturing them with food and Love. I have no idea if someone is walking in the Burbank steps ... to offer food ... vegetable food in High Quantities ... to the World ... Probably not. The best I can do ... is my job ... and release books. Do you believe in God? ... Do you believe in a vengeful God ... or you are a stupid unable to understand Mathematics and Biology and reject the efforts of persons that live to help other? I hope you want to open a retrospective on yourself ... and forget the mechanical world that lead you to the doors of death ... with famine and without Abundance.